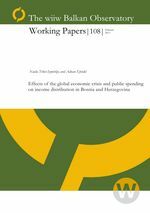 This research focuses on the relationship between public spending and income distribution in Bosnia and Herzegovina (BiH). In our empirical strategy we rely on a unique survey data used to establish a proxy for inequality over the observed period 2000-2010. In addition, we investigate the consequences of contemporary global economic and financial crisis on income distribution. We find indications that the global economic crisis, with its BiH onset in 2009-2010, has increased income inequality in BiH. Our findings also imply that increased public spending and improvement in the quality of institutions in BiH were supportive in reducing income inequality over the observed period. After examining several institutional indicators, we identify a particular importance of political stability in BiH as a determinant of income distribution. Disaggregated analysis of public spending by functional and economic categories revealed that higher expenditures for social protection and capital spending are associated with lower income inequality. Contrary, higher expenditures for education are linked with higher income inequality.